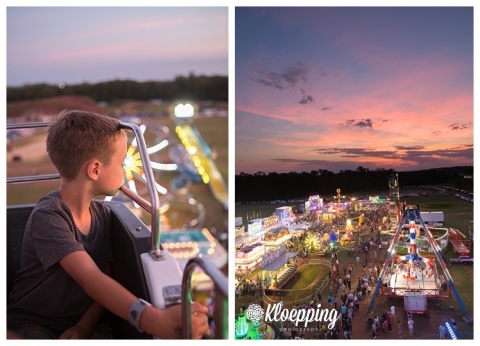 Nothing screams summer than a night of carnival rides and food. We always try to make it to at least one carnival/fair each summer and it’s not hard since it seems that every town and HOA around us throws one! To a momtog (mom photographer for those unfamiliar:) ), carnivals are the perfect place for some fun photography. So, despite my husbands complaints, I threw the dSLR into my bag and off we went. This year we tried the carnival at OneLoudoun. I saw the Facebook posts and notes from friends and decided, at the last minute, to take the kids. Best decision ever! They had a blast! We sprung for the unlimited wrist band instead of dealing with sheets of tickets and it was so much easier. I’m sure we got our money’s worth because Lia’s still a peanut and needed accompanied on most rides. This is the first year that she could really ride anything solo. Last year she was just a bit too short. So, it was so much fun watching her face as she experienced each new ride. She’s a ham to begin with and is constantly making faces at me but some of these were new. My favorite moment was actually on their first rid. We put them on the teacups together and Noah was in charge of spinning the cup. As he spun her, she threw her head back in pure joy and laughter. We warmed them to the big ferris wheel by trying the kiddie one first. Noah was a bit bored but Lia loved the high vantage point. As she rounded the top they’d both lean forward to look down at us and wave. We spent a good 4 hours there. As the evening progressed it was getting more and more crowed, even on the kiddie rides. But, a quick stop for cotton candy, the kids were riding a sugar high and powered through a bunch more rides. Once we got up the views did not disappoint and I have to say that the sunset was on point! I couldn’t have asked for a more beautiful night to enjoy with my family. Even hubs and Noah stopped for a selfie while we were at the top.